The 2010-11 season of the Goshen College Performing Arts Series will again bring an incredible breadth of top quality arts performances to the college, including Preservation Hall Jazz Band, Conspirare, Wailin' Jennys, Shawn Colvin and Loudon Wainwright III, BeauSoleil avec Michael Doucet, Flamenco Vivo Carlota Santana, The 5 Browns and the St. Petersburg Philharmonic. 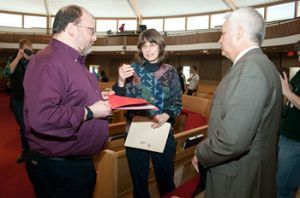 Two Goshen College faculty members united in their commitment to pacifism, the teachings of the Mennonite church and extending Christian hospitality to others presented conflicting opinions on playing the national anthem before sports events at the college. History was made today at Goshen College as the national anthem was played before two sports events for the first time since intercollegiate athletics began at the college in 1957. The anthem was played before a 1 p.m. baseball team doubleheader against Siena Heights University and softball team doubleheader against St. Joseph's College at 3 p.m.
Goshen College will play the national anthem before sports events for the first time on March 23 and will hold a campus-wide dialogue on the issue on March 24. In January, the Goshen College Presidents Council, led by President Jim Brenneman, decided to allow the college's Athletic Department to play an instrumental version of the national anthem prior to some sporting events beginning this spring. In preparing for that change in practice to be implemented- beginning with the March 23 baseball and softball games -the President's Council recently affirmed the plans of the Athletic Department. Goshen College Sustainability Coordinator and Utilities Manager Glenn Gilbert and Vice President of McCormick Motors (Nappanee, Ind.) Gordon Moore will talk about the fascinating ways that saving energy is not only "green," but also makes sense for the fiscal bottom line of an institution and a business. This will be the Goshen College Afternoon Sabbatical presentation on Tuesday, March 9 at 1 p.m. in the Music Center's Sauder Concert Hall. The event is free and open to the public.